In this tutorial, we will look at the installation process of TypeScript and the editor setup for TypeScript development. Microsoft does well in providing easy-to-perform steps to install TypeScript on all platforms, namely Windows, macOS, and Linux. The following excerpt is taken from the book TypeScript 2.x By Example written by Sachin Ohri. This book presents hands-on examples and projects to learn the fundamental concepts of the popular TypeScript programming language. TypeScript’s official website is the best source to install the latest version. On the website, go to the Download section. There, you will find details on how to install TypeScript. Node.js and Visual Studio are the two most common ways to get it. It supports a host of other editors and has plugins available for them in the same link. We will be installing TypeScript using Node.js and using Visual Studio Code as our primary editor. You can use any editor of your choice and be able to run the applications seamlessly. If you use full-blown Visual Studio as your primary development IDE, then you can use either of the links, Visual Studio 2017 or Visual Studio 2013, to download the TypeScript SDK. Visual Studio does come with a TypeScript compiler but it’s better to install it from this link so as to get the latest version. One of the outstanding features of TypeScript is its support for editors. All the editors provide support for language services, thereby providing features such as IntelliSense, statement completion, and error highlighting. If you are coming from a .NET background, then Visual Studio 2013/2015/2017 is a good option for you. Visual Studio does not require any configuration and it’s easy to start using TypeScript. As we discussed earlier, just install the SDK and you are good to go. If you are from a Java background, TypeScript supports Eclipse as well. It also supports plugins for Sublime, WebStorm, and Atom, and each of these provides a rich set of features. Visual Studio Code (VS Code) is another good option for an IDE. It’s a smaller, lighter version of Visual Studio and primarily used for web application development. VS Code is lightweight and cross-platform, capable of running on Windows, Linux, and macOS. It has an ever-increasing set of plugins to help you write better code, such as TSLint, a static analysis tool to help TypeScript code for readability, maintainability, and error checking. VS Code has a compelling case to be the default IDE for all sorts of web application development. 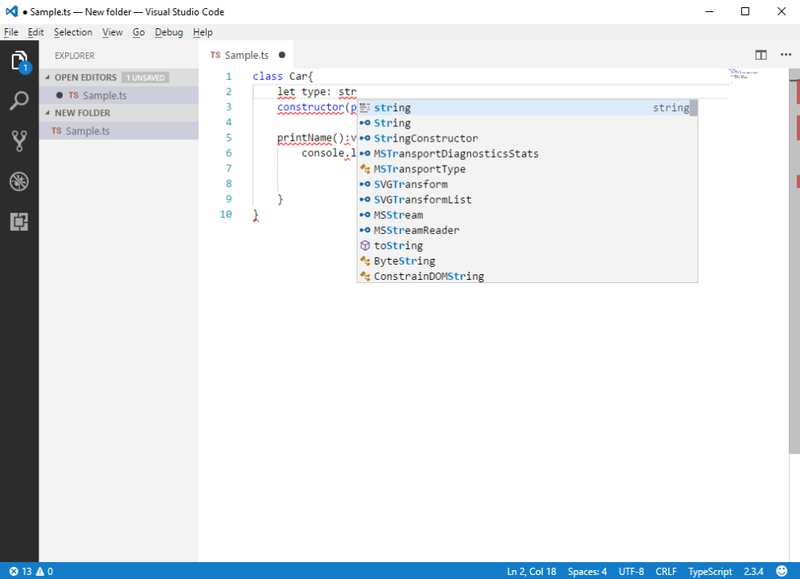 In this post, we will briefly look at the Visual Studio and VS Code setup for TypeScript. With Visual Studio, creating a project with a TypeScript file is as simple as adding a new file with a .ts extension. 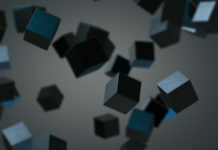 Visual Studio will provide all the features out of the box. 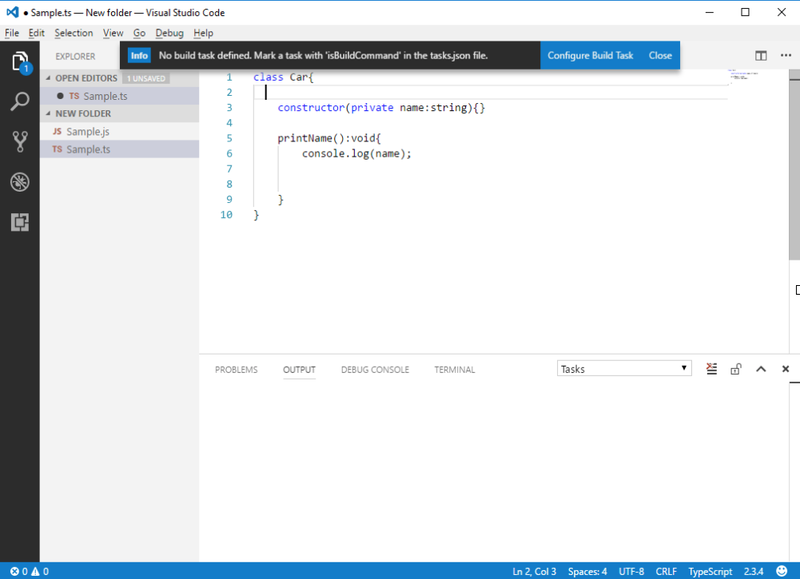 VS Code is a lightweight IDE from Microsoft used for web application development. VS Code can be installed on Windows, macOS, and Linux-based systems. VS Code can recognize the different type of code files and comes with a huge set of extensions to help in development. You can install VS Code from https://code.visualstudio.com/download. To run the project in VS Code, we need a task runner. VS Code includes multiple task runners which can be configured for the project, such as Gulp, Grunt, and TypeScript. 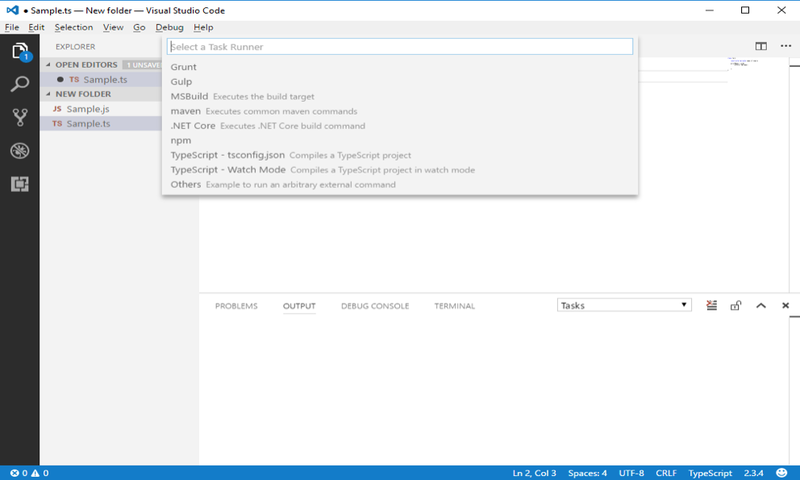 We will be using the TypeScript task runner for our build. This creates a new folder in your project, .vscode and a new file, task.json. This JSON file is used to create the task that will be responsible for compiling TypeScript code in VS Code. To run the TypeScript compiler, there are a couple of options. One is to integrate the compiler in your editor of choice, which we explained in the previous section. In the previous section, we also integrated the TypeScript compiler with VS Code, which allowed us to build our code from the editor itself. All the compiler configurations that we would want to use are added to the tsconfig.json file. As you can imagine, running the tsc command manually for medium- to large-scale projects is not a productive approach. Hence, we prefer to use an editor that has TypeScript integrated. allowUnusedLabels boolean By default, this flag is false. This option tells the compiler to flag unused labels. alwaysStrict boolean By default, this flag is false. When turned on, this will cause the compiler to compile in strict mode and emit use strict in the source file. module string Specify module code generation: None, CommonJS, AMD, System, UMD, ES6, or ES2015. moduleResolution string Determines how the module is resolved. noImplicitReturn boolean Default value is false; raises an error if not all code paths return a value. noUnusedLocals boolean Reports an error if there are any unused locals in the code. noUnusedParameter boolean Reports an error if there are any unused parameters in the code. outDir string Redirects output structure to the directory. outFile string Concatenates and emits output to a single file. The order of concatenation is determined by the list of files passed to the compiler on the command line along with triple-slash references and imports. See the output file order documentation for more details. removeComments boolean Remove all comments except copyright header comments beginning with /*!. sourcemap boolean Generates corresponding .map file. Target string Specifies ECMAScript target version: ES3(default), ES5, ES6/ES2015, ES2016, ES2017, or ESNext. Watch Runs the compiler in watch mode. Watches input files and triggers recompilation on changes. We saw it is quite easy to set up and configure TypeScript, and we are now ready to get started with our first application! To learn more about writing and compiling your first TypeScript application, make sure you check out the book TypeScript 2.x By Example.